People may think of Social Security as more of a safety net than an investment, but viewing it through an investor’s lens can help determine how it will fit into your financial future. To delay or not to delay filing? Please complete the form on this page to receive this free, no-obligation report today! A copy of Social Security’s Role in Your Retirement was sent to the email address you provided. Also, a copy of Social Security’s Role in Your Retirement has been sent to the email address you provided. Some people think of Social Security as more of a safety net than a retirement savings account, but for many, the monthly payments are a significant source of retirement income. No matter what role Social Security will play in your retirement, it’s worth gaining a greater understanding of how the program works and viewing it through an investor’s lens to determine how it will fit into your plans for the future. Clearly, those of you who have been able to fund a good nest egg won’t have to rely as much on Social Security. But we still believe that your monthly check should be accounted for when building your portfolios ahead of retirement. And if you’re in a position to delay taking Social Security, the added return may be the best guaranteed income investment you can make. The primary benefit of Social Security is monthly income. Once you stop paying into the program, you will have a predetermined amount set aside based on what you earned over your career. That income, which is adjusted annually for inflation, will be paid to you every month whether you live another 20, 30 or 40 years. To receive benefits, you must have worked at least 10 full years at a job covered by Social Security. To maximize your potential earnings, however, you need at least 35 years of employment. Why? The Social Security Administration determines your benefit amount by considering your highest 35 years of income and then runs a series of calculations to determine your monthly payment. Spousal benefits built into Social Security entitle a spouse (or ex-spouse) to, generally, half of the fully earned benefit of his or her better half and can be an important factor in maximizing benefits regardless of whether one spouse was the primary breadwinner or both earned similar amounts in their respective careers. Survivor benefits are also available for a spouse and any dependents—the amount will be calculated based on what was contributed to Social Security as well as your family members’ ages and relationship to you. If the surviving spouse is a retired worker, he or she is entitled to the higher amount of benefits being paid to the household. It’s tough to find an investment that guarantees an 8% annual return. Social Security can be one of them. At the earliest, you can begin receiving Social Security benefits when you turn 62, while eligibility for full benefits begins after age 66 for those born between 1943 and 1954—if you were born after that, the full retirement age gradually increases up to 67 for people born in 1960 and later. You also have the option to defer benefits until age 70. Those who begin receiving Social Security at their earliest eligibility will only receive about 75% of what is known as their primary insurance amount (PIA, or the monthly payment), while those who wait until full retirement age will receive 100% of their PIA. For every month after full retirement age up to age 70 that you defer filing for Social Security, your benefit increases by two-thirds of a percent, which works out to 8% a year. Put another way, by delaying, your monthly payment will grow to as much as 32% more than the full retirement age amount—for the rest of your life and then that of a surviving spouse. Note that there is no benefit to waiting past age 70 to apply for benefits. These delay credits haven’t been changed since 1983, and are based on actuarial charts that are now more than 30 years old. Given that people are now living longer on average and interest rates and bond yields are considerably lower, the benefits of delaying are even more lucrative today than they were back in the ’80s. Delaying your benefits can also provide excellent retirement portfolio protection. Paying for short-term income needs from portfolio assets during your 60s can really work wonders; higher benefits from waiting until age 70 could reduce the amount you’ll need to withdraw from your investment portfolio in later years, leaving more for your heirs or more to spend as you grow older. A 2015 study by the Center for Retirement Research showed that 48% of eligible women and 42% of eligible men took Social Security benefits at the earliest possible time (age 62). That number jumps to 64% and 56%, respectively, when you include people who claim before full retirement age (66). 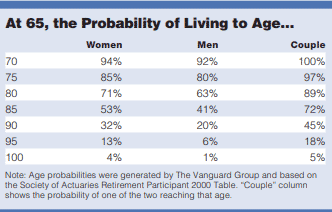 Only 4% of women and 2% of men waited until age 70 to file. Of course, maximizing benefits is not as simple as picking an age to collect—you also need to take your life expectancy, employment and marriage status, as well as other sources of income and taxes, into account. If you need the income for expenses sooner rather than later or worry that you are destined to a shorter life expectancy, it may make sense to apply for benefits before reaching full retirement age. Perhaps you want some mad money to use while you’re still young—you’ve earned it, and it’s obviously yours to do with as you choose. But for those with the means to do so, patience can be a savvy investment virtue. And if you or your spouse plan to work late into your 60s or beyond, deferring until age 70 makes even more sense. The Social Security Administration’s website offers a number of calculators and articles that can help you figure out what your payments might be based on these various factors, but discussing the topic with a trusted financial adviser who can help you navigate the program’s complicated rule set and work with you on an overall retirement income plan might be your best option. Since Social Security will likely be a meaningful portion of your income in your retirement, you owe it to yourself for all of your years of hard work to create a plan that will help you get all that you can. Download your free copy of Social Security's Role in Your Retirement now!